You’ll often find a maze in the grand, landscaped gardens of Europe. Originally conceived as continuous or unicursal pathways, several hundred years ago garden designers began to plant puzzle-like hedge mazes to amuse garden owners and their guests. The oldest surviving puzzle hedge maze, at Hampton Court Palace in Surrey, England, was built for King William in the late 17th century, while the modern hedge maze at Longleat House in Wiltshire, England, designed in 1978, features a three-dimensional design incorporating bridges and a grid-less layout to confuse visitors. Artists and designers often turn to the maze to create immersive experiences. 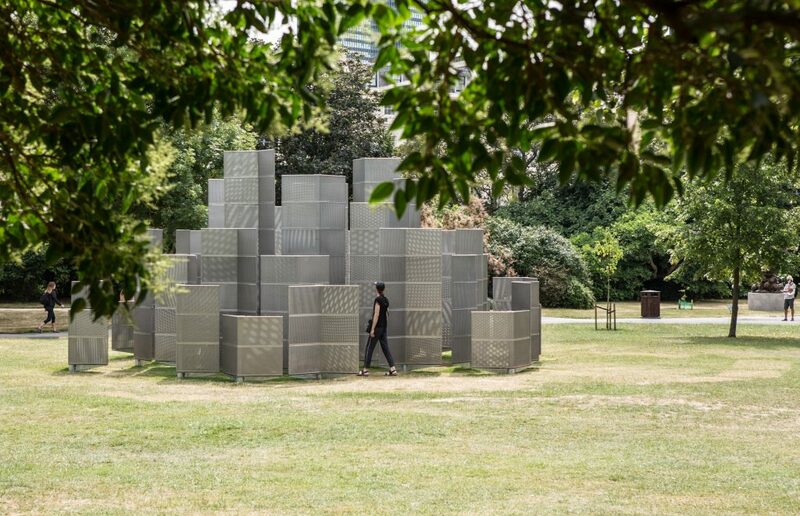 One of those is the Optic Labyrinth by Conrad Shawcross in Regent’s Park as part of Frieze Sculpture 2018, taking place until October 7. The new, large-scale work takes the form of a simple, immersive maze that also engages with the seasons and the sun’s shifting position throughout the day, focusing specifically on how people navigate and orientate themselves both emotionally and physically in relation to its rise and fall. 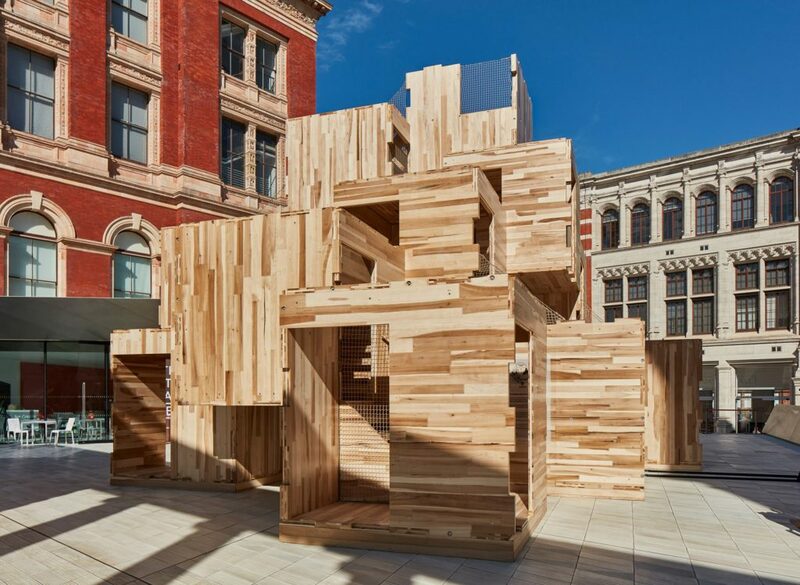 MultiPly was a modular wooden maze by Waugh Thistleton at the V&A Sackler Courtyard this September as part of the London Design Festival. The nine-metre-high maze, built from cross-laminated timber to demonstrate the potential of carbon-neutral buildings, was the first to showcase British-made CLT – a type of engineered wood that is much stronger than standard timber. 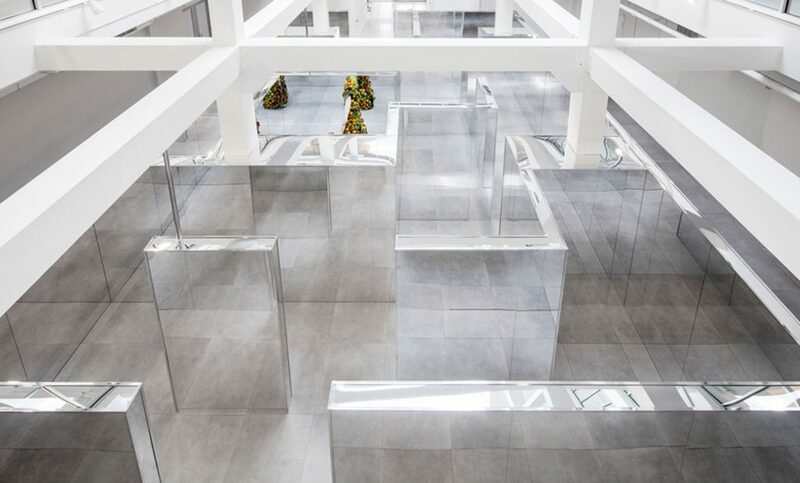 The installation comprised a series of cube-shaped rooms connected by many staircases and bridges. 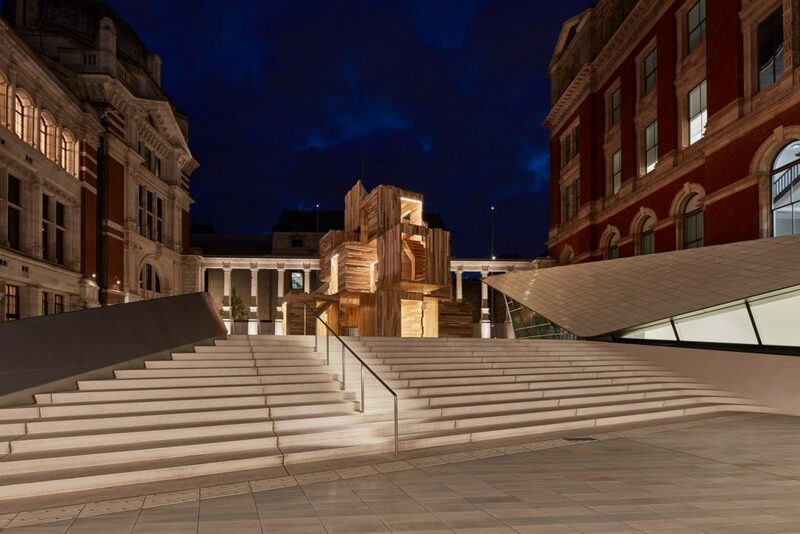 Openings in each cube framed unique views of the V&A and its recently added Sackler Courtyard, while at night, soft lights set in the doorways illuminated the timber tower with a soft glow. The project was a collaboration between the architect studio, engineering firm Arup and the American Hardwood Export Council (AHEC). The CLT was manufactured in Scotland, using American tulipwood. The process involves layering sections of wood at right angles, then gluing them together. MultiPly comprises 111 panels of CLT, locking in 30–tonnes of carbon dioxide, which means, says its makers, that all the emissions from making and transporting the raw materials are offset, making it a carbon-neutral structure. Back in 2016 the ICA Miami’s Atrium Gallery played host to a vast and immersive mirrored labyrinth as part of the I Stand, I Fall survey of work by the influential, conceptual artist John Miller. The exhibition brought together some 75 works in a range of media, including painting, sculpture, drawing, photography, installation and video; never-before-seen works from the 1980s and new, large-scale sculptures including his most ambitious architectural installation – the mirrored labyrinth, all of which sought to examine themes of citizenship and politics, and the conventions of realism in contemporary art. Also in 2016 was stage designer Es Devlin’s video sculpture Mirror Maze, which explored the powerful experience of scent with an interactive, immersive video sculpture created in Peckham, South London and inspired by Chanel Fragrance. This was the first artistic project by The Fifth Sense, a partnership between Chanel and i-D magazine. It considered the philosophical idea of scent with a multi-sensory world.